T he seniors at PCA&D are immersed in the creation of their senior theses, the culmination of their BFA degree. Each senior has his or her own studio space at PCA&D in which they create his or her thesis, which will be exhibited during the Senior Show and Celebration , Friday May 6, 5-8 p.m.
As the senior theses evolve, so do the Senior Studios, showcasing each artists's individuality and personality. 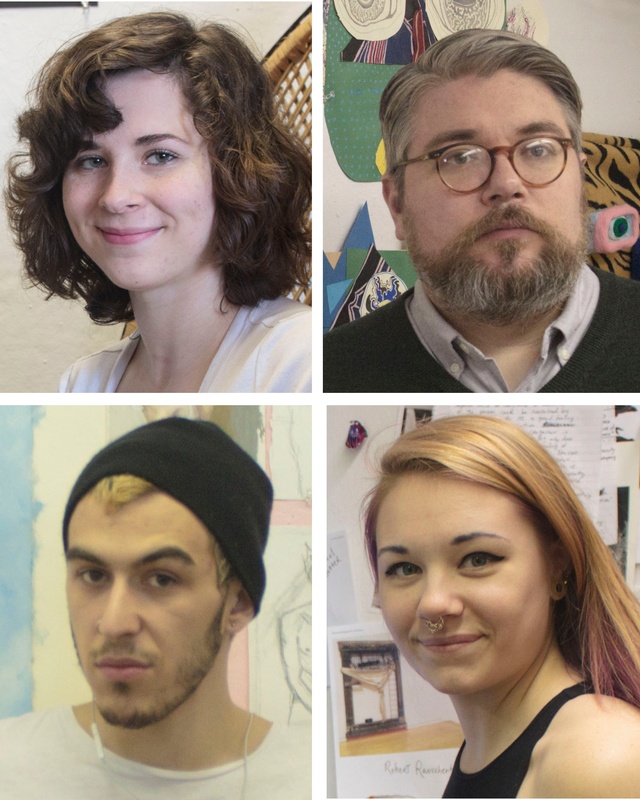 Here are a look at the studios of four Fine Art Seniors, Alexandria Bonner, Jason Herr, Erich Bell, and Alexis Supplee, as they work on their theses. Alexandria Bonner: I enjoy the fine details of life, whether it is through a drawing, arranging apple slices on a plate, or choosing jewelry for the day. I’ve been an artist my whole life; something I have struggled to accept for a long time. Now that I realize this, the majority of my day is spent developing the art in the studio and at home. I am looking forward to the senior show. Seeing other artists’ work always inspired me, now I will have that opportunity to inspire others. Ultimately, I desire to impact the viewer emotionally and to uncover their inner passion for life. I wish to see a world with more dedication and passion; therefore that is what I am practicing. Jason Herr: Having a studio space really helps the process in which I make art. I like to surround myself with imagery that will spark inspiration. I often have stacks of art books around the studio in which I will pull from. Being able to inhabit this personalized space makes it easier to transfer to a more creative thought process. This has helped me move into a more confident phase of my image making. Erich Bell: My work is a visual representation of memories, feelings and my life. It’s an exploration of my identity as a twenty-one year old gay man. Typically my work is a staged self-portrait that is either a representation of life or a more metaphorical image. It beginnings with a phrase, a song lyric or a feeling, then I search for or create the photo imagery, and translate it into an oil painting. These are created through provocative compositions that capture different aspects of my personality. They feature different stereotypes or personas, dressing up as desserts, or hiding the figure's face, but exposing their body. I capture the world for what I see it as and often make work that deals with self-loathing, vulnerability, confidence vs shame and feminine vs masculine qualities. Alexis Supplee: As a senior Fine Artist, I have been working with found objects that correspond with nature and man. My art pieces have a darker feeling to them due to the use of bones, nails and salvaged wood. The art pieces aren’t supposed to be negative but more of a way to connect with what the world, and nature has to offer. I combine man-made objects and things found in nature to show they can go along in harmony. Follow the blog for additional looks into the Senior Studios, as the Class of 2016 perpares for commencement and the Senior Show and Celebration.